Welcome your guests to the table with asparagus dressed with a sweet vinaigrette and garnished with slices of fig. Everything can be prepared ahead, then arranged on the plates just before the meal. Prepare the asparagus by trimming about 2cm off the coarse stems. Then place in a pan of boiling water and simmer for 5-6 minutes until just tender. Drain and refresh under cold running water, then cover with clingfilm and chill until needed. To prepare the dressing, finely chop 3 figs and place in a small pan. Cover with boiling water and simmer for 2 minutes. Remove from heat, drain and cool for 2 minutes. Place in a bowl and stir in the olive oil, lemon juice and zest. Season generously with black pepper, cover and chill. Thinly slice the remaining figs, wrap in clingfilm and chill. Assemble up to 20 minutes before the meal. Cut the asparagus in half lengthways and divide between 6 plates in a row or stack. Stir a little freshly ground black pepper into the goat's cheese and then spoon it over the asparagus. Roll slices of ham together in loose rose-like circles and place on the cheese. Arrange a few fig slices around the edge of each plate. 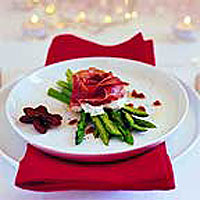 Just before serving, whisk the fig dressing and drizzle a generous amount over the asparagus, cheese and Parma ham. Season with freshly ground black pepper and serve immediately. You could also use a ready-made dressing, such as Waitrose Perfectly Balanced Balsamic and Red Pepper Dressing.